Map of the West Bank. 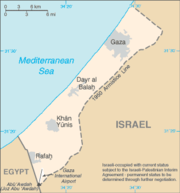 Map of the Gaza Strip. The Palestinian territories is one of a number of designations for those portions of the British Mandate of Palestine captured and militarily occupied by Egypt and Jordan, and later, in the Six-Day War, by Israel. The designation refers to the West Bank, Gaza Strip and East Jerusalem, but does not include the Golan Heights or the Sinai Peninsula, which were also captured by Israel in 1967, although the Sinai Peninsula was later returned to Egypt. Other terms used to describe these areas together are "occupied Palestinian territories", " Israeli-occupied territories", though all of these are, in context, simply referred to as "the occupied territories." More terms include "disputed territories", " Judea and Samaria, and Gaza", " Yesha", "liberated territories", "1967 territories", and simply "the territories". The United Nations generally uses the term "Occupied Palestinian Territory," with the "Palestinian" label having gained use since the 1970s. Previous UNSC resolutions (such as 242 and 338) use the term "Territories occupied by Israel", whereas in the UN General Assembly Resolution 181 passed on November 29, 1947, the term "Samaria and Judea" was used. Some Jews and Christians object to the term "Palestinian territories", which they perceive as a rejection of what is in their view legitimate Jewish land. The political status of these territories has been the subject of negotiations between Israel and the Palestine Liberation Organization (PLO) and of numerous statements and resolutions by the United Nations. See List of UN resolutions against Israel for further details. The current and future political status of the territories is highly controversial. Specific issues include the legality of Israeli's policy of encouraging settlement, whether it is legitimate for Israel to annex portions of the territories, whether Israel is legally an occupying power according to the Fourth Geneva Convention, and whether an independent Arab state will be created in the territories (see Proposals for a Palestinian state). Since 1994, the autonomous Palestinian Authority has exercised various degrees of control in large parts of the territories, pursuant to the Oslo Accords. The Israeli government's position remains to be defined, following that country's 2006 legislative elections, but it appears that the new government will pursue a policy of partial withdrawal (if necessary, unilaterally) from the West Bank, an initiative known as the Realignment plan, while aiming to retain all of East Jerusalem and some other areas, including major West Bank settlement blocks. The boundaries between the West Bank and the Gaza Strip and the State of Israel, known as the Green Line, are a result of the 1949 Armistice Agreements after the 1948 Arab-Israeli War, while their boundaries with Jordan and Egypt follow the international border between the former Mandate for Palestine and those states. The natural geographic boundaries for the West Bank and the Gaza Strip are the Jordan River and the Mediterranean Sea, respectively. Between 1949 and 1967, these territories were occupied by Jordan and Egypt respectively, but the term "Palestinian territories" or "Occupied Palestinian Territories" gained wide usage after Israel's victory in the 1967 Six-Day War, about the same time as the term "Palestinian" first started to be used exclusively in respect to Arab population of Palestine. Since then, the United Nations and most foreign governments regard the territories as being under Israeli military occupation. some Arab nationalists, who consider the land within Israel's de facto boundaries to be de jure part of a "Palestinian state." Some advocates have claimed that maps used in schools under the jurisdiction of the Palestinian Authority depict this state as consisting of all the territory between the Mediterranean Sea, Lebanon, Syria, the Jordan River and Egypt — including Israel, the West Bank and Gaza Strip. The term is often used interchangeably with the term Occupied territories, although the latter refers to an inclusive set of both the "Palestinian territories" and the Golan Heights. The Golan is not settled by "Palestinians" nor claimed by them, but rather by Syria, though the tiny Shebaa Farms area is also claimed by Lebanon. The confusion stems from the fact that all these territories were captured by Israel during the 1967 Six-Day War and are regarded by the United Nations as being under military occupation. Shmuel Katz and other right-wing sectors of Israeli society assert that the term "occupied Palestinian lands" is "the common language of Arab anti-Israel propaganda, a part of the Arabs' fictional history, which it has succeeded in disseminating throughout the whole wide world". According to Katz, impartial groups should "not be blind to the fact that there are two sides to the dispute in Palestine, and that Israel rejects absolutely the notion that it is illegally holding 'Palestinian lands'." In 1922 after the collapse of the Ottoman Empire that ruled the region of Palestine for four centuries (1517-1917), the Mandate for Palestine was established. Large-scale Jewish immigration from abroad, mainly from Eastern Europe took place during the British Mandate . The future of Palestine was hotly disputed between Arabs and Jews. In 1947, the total Jewish ownership of land in Palestine was 1,850,000 dunums or 1,850 square kilometers, which is 7.04% of the total land of Palestine. Public property or "crown lands" belonging to the government of Palestine made up as much as 70% of the total land; with the Arabs, Christians and others owning the rest. .
Jewish groups (notably the Jewish Agency) generally supported the partition plan. Arab groups (all Arab countries in the U.N. voted against it) generally rejected the partition plan and subsequently invaded the newly formed State of Israel, starting the Israeli War of Independence. For nineteen years following the 1949 Armistice Agreements until the 1967 Six Day War, Egypt occupied the Gaza Strip and Jordan occupied the West Bank and East Jerusalem, and no Arab state was created. In 1950, Jordan annexed the territories it occupied; this annexation was not officially recognized by other countries, with the sole exception of the United Kingdom (but not, as is often said, Pakistan). The Article 24 of the Palestinian National Charter of 1964 stated: "This Organization does not exercise any territorial sovereignty over the West Bank in the Hashemite Kingdom of Jordan, on the Gaza Strip or in the Himmah Area." Israel captured both territories in the 1967 Six-Day War; since then they have been under Israeli control. After the war, UN Security Council Resolution 242 introduced the " Land for Peace" formula for normalizing relations between Israel and its neighbors. The Oslo Accords of the early 1990's between the Palestine Liberation Organization and Israel led to the creation of the Palestinian Authority. This was an interim organization created to administer a limited form of Palestinian self-governance in the territories for a period of five years during which final-status negotiations would take place. The Palestinian Authority carried civil responsibility in some rural areas, as well as security responsibility in the major cities of the West Bank and the Gaza Strip. Although the five-year interim period expired in 1999, the final status agreement has yet to be concluded despite attempts such as the 2000 Camp David Summit, the Taba summit, and the unofficial Geneva Accords. The final status of the "Palestinian territories" as becoming (wholly or largely) an independent state for Arabs is supported by the countries that back the Quartet's " Road map for peace". The government of Israel also accepted the road map but with 14 reservations . Although Israeli settlements were not part of the Oslo Accords negotiations, the Arab position is that the creation and the presence of Israeli settlements in those areas is a violation of international law. This has also been affirmed by a majority of members of the Geneva convention: "12. The participating High Contracting Parties call upon the Occupying Power to fully and effectively respect the Fourth Geneva Convention in the Occupied Palestinian Territory, including East Jerusalem, and to refrain from perpetrating any violation of the Convention. They reaffirm the illegality of the settlements in the said territories and of the extension thereof. They recall the need to safeguard and guarantee the rights and access of all inhabitants to the Holy Places." East Jerusalem, captured in 1967, was unilaterally annexed by Israel. The UN Security Council Resolution 478 condemned the Jerusalem Law as "a violation of international law". This annexation has not been recognized by other nations, although the United States Congress has declared its intention to recognize the annexation (a proposal that has been condemned by other states and organizations). Because of the question of Jerusalem's status, some states refuse to accept Jerusalem as the capital of Israel, and treat Tel Aviv as the capital, basing their diplomatic missions there. Israel asserts that these territories are not currently claimed by any other state, and that Israel has the right to control them. Israel's position has not been officially accepted by most countries and international bodies. The West Bank, and the Gaza Strip have been referred to as occupied territories (with Israel as the occupying power) by Palestinian Arabs , the rest of the Arab bloc, the UK , the EU, (usually) the USA ( , ), both the General Assembly and the Security Council of the United Nations , the International Court of Justice, and the Israeli Supreme Court (see Israeli West Bank barrier). The United Nations did not declare any change in the status of the territories as of the creation of the Palestinian National Authority between 1993 and 2000. Although a 1999 U.N. document (see the link above) implied that the chance for a change in that status was slim at that period, most observers agreed that the Palestinian territories' classification as occupied was losing substantiality, and would be withdrawn after the signing of a permanent peace agreement between Israel and the Palestinians (see also Proposals for a Palestinian state). During the period between the 1993 Oslo Accords and the Second Intifada beginning in 2000, Israeli officials claimed that the term "occupation" did not accurately reflect the state of affairs in the territories. During this time, the Palestinian population in large parts of the territories had a large degree of autonomy and only limited exposure to the IDF except when seeking to move between different areas. Following the events of the Second Intifada, and in particular, Operation Defensive Shield, most territories, including Palestinian cities (Area A), are back under effective Israeli military control, so the discussion along those lines is largely moot. In the summer of 2005, Israel implemented its unilateral disengagement plan; about 8500 Israeli citizens living in the Gaza Strip were forcibly removed from the territory; some received alternative homes and a sum of money. The Israeli Defence Forces vacated Gaza in 2005, but invaded it again in 2006 in response to rocket attacks and the abduction of Israeli soldier Gilad Shalit by Hamas. United Nations Security Council Resolution 242 (S/RES/242), one of the most commonly referenced UN resolutions in Middle Eastern politics, was adopted unanimously by the UN Security Council on November 22, 1967 in the aftermath of the Six Day War. It was adopted under Chapter VI of the United Nations Charter , and was reaffirmed and made binding by UN Security Council Resolution 338, adopted after the 1973 Yom Kippur War. The resolution calls for the "withdrawal of Israeli armed forces from territories occupied in the recent conflict" (there has been some disagreement about whether this means all the territories: see UN Security Council Resolution 242: semantic dispute) and the "[t]ermination of all claims or states of belligerency". It also calls for the mutual recognition by the belligerent parties (Israel, Egypt, Syria, Jordan) of each other's established states and calls for the establishment of secure and recognized boundaries for all parties.